Hello all. I've been a member here for a while, but rarely post. I hope you will guide me if this is the wrong forum, of if i should post this issue differently. It's a big deal, and I'm concerned, so have to start somewhere. I recently sent a beautiful, 2.41, royal blue, cushion cut Kashmir sapphire that was my great grandmother's to a well known gem lab (can't say the name for legal reasons) in New York. I gave it to a trusted jeweler I've known for 30+years, who insured it, and sent it to her cutter in N.Y.C first to get a cost estimate in case I wanted to polish it before getting it evaluated for origin. I decided not to, and to keep the the time worn look and little scratches to preserve its original "character". The stone was in their hands for about 4 days. It was delivered to the lab, and was there for almost 7 weeks. I was told this was because their best gemologists were in Hong Kong for the September show or meeting. The stone came back 2.43 carat, Kashmir country of origin. Great! Just as we thought, and as a prior appraiser had said, in writing, many years ago. My jeweler unwrapped the stone... It was purple, not a sleepy velvet blue. I said right away, "Oh wow! That's weird...I didn't think my sapphire had that much purple tone in it." My jeweler said, "It's just the lighting, or maybe it's cleaner now." Yes, the 'new' one matched the picture on the lab cert., but not my personal photos of the gem, or my clear memory of it. ( I know lab lighting is different but...) The measurements were almost the same ( I was told calpers can vary etc.). I had clearly said to my jeweler before sending, "What's incredible about this stone is the perfect sleepy blue velvet color, almost royal blue". She knew, and agreed. Honestly, once you see one in person you never forget it. It's just THAT rare a color. Now, here's the thing, I spoke to her, we've had a tough time with this, as she insists her cutters are honest, the lab is honest etc. I will post the pics taken in the same light, time of day, camera etc. Could they have Sarined it, CAD-ed it and replicated the shape/facets/scratches and switched it out? Is that even possible? Only the FIRST picture is of the original Kashmir, the rest are what was returned to me. These stones look the same to me. I'm sorry you are unhappy , but there's almost zero chance of any reputable jeweler / lab replicating a stone down to the scratches. Are you a gemologist? My question is really, can this be done? Nope, not a gemologist, just a consumer who has spent time on these boards. From what I understand, this would be almost impossible to accomplish. masonoh and aussiejamie like this. Thanks Lovedogs. I noticed you often work with cutters to get your gems done. Maybe a gem cutter would be able to tell me if 7 weeks would give him enough time to replicate the sapphire, and swap it out for a lesser color. There is another forum (which I am not 100% sure I am allowed to link to here, maybe someone else can correct me? However you can find it relatively easily using google and a little paitience.). You will find a lot of gemologists and lapidaries there. This forum is consumers. Some of them are very knowledgable though -- perhaps more educated than some of the jewlers you may be dealing with. Obviously I am not writting this about myself (i know comparitively little) so you can take the following with a grain of salt. Off the bat though, it seems very difficult to match two sapphires like that closely. Kashmiri sapphires of that size are few and far between, and finding such a match is very unlikely (even if they had months it would be a near impossible task). elle_71125, tigertales and lovedogs like this. Also a lot of blue sapphire can shift into more purple tones depending on the type of light. I have a full on color change Burmese that is pure royal blue in sunlight and deep amythest purple Indoors but non color change sapphires can still have color shifts. In the above two photos the lighting source looks difference based on how different the “white” background looks. Have you seen the stone outside in natural light where most sapphires look their bluest? I agree with above posters that a switch would be unlikely. Do you by chance live in a region where you are currently experiencing overcast winter weather? I am and most of my medium to medium dark stones shift to their least attractive color this time of year and stay that way until the sun starts shining brightly again in the spring. Just a thought. For sure it is possible to reproduce a saphire within 7 weeks, if you have the according rough. But in this example the pics are misleading, as they are different in lighting or making. Just compare the colour of the gold itself in the 2 pics. They are not even close to each other, so why should the saphire be? Cleaning could do something if it hasnt for years, but wont change colour of a stone. Normally helps to "open" a stone again if it is dirty or uncleaned. I did not hear of a major known lab to switch a stone, so it does not help us here, because it can happen but would kill a labs reputation and trust totally. masonoh, Sparkle_ruckle, qubitasaurus and 2 others like this. I appreciate you worry the sapphire has been switched however please consider these points. 1. Why would anyone replace your Kashmir Sapphire with another Kashmir sapphire? Kashmir sapphires are rare. To make a replica one exactly like “yours” ie same shape, facet pattern and weight they’d have to start by cutting down in size an even bigger size Kashmir sapphire - No one would want to cut down a bigger Kashmir sapphire to make a replica of your 2.43 carat. 2. The colour has changed? The colour can be slightly different depending on the type of light and the quality of light. A Sapphire is dichroic, it has two colours so depending on the direction of the light / the angle of viewing. The best colour is usually seen “looking down”, a cutter will always try orientate the crystal to get the best colour face up. If you look at it off centre / side on, it is likely to be a slightly different color. So the probability of a reputable gem lab deciding to “switch” Kashmir sapphires by recutting another Kashmir sapphire to match yours or them having a exact same shape, facet pattern and carat weight in a less “blue” colour Kashmir Sapphire waiting to be “swapped” with yours, is like None. masonoh, babs23r, elle_71125 and 10 others like this. I guess one way to check things would be to resubmit the stone you have in your possession now to the/another grading lab, to see what it comes back as?? tigertales, voce and digdeep like this. I think it's almost impossible to re-make a gem with the exact same dimensions. If you have the before-after dimensions down to a 1/100mm and they are the same, chances are it's the same stone. The only logical switch would be to get a non-Kashmir sapphire and have it replace yours. Then, try to replicate the bumps and abrasions. Switching with a Kashmir would be impossible. If Kashmir rough still existed, it would be cut. The mines stopped producing in the 1890s. 1) You need to determine if the sapphire you have is, in fact, a Kashmir. Very few will be considered expert enough to document this to a legal standard. GIA and Gubelin are the only bodies likely to be considered reliable enough to fight about this in court. 2) You mentioned that you initially sent this stone to a polisher in NYC to discuss gets the bumps and abrasions repaired. You elected not to do that and sent the stone to a grading lab thereafter. Does the stone in your possession have those bumps and abrasions? Presumably, the cutter documented those either by hand or with photos. Do they match? I agree with others that the stones looks the same. But, you can do your own work to determine that is the case. I spent my childhood staring at my moms over 4 carat Kashmir sapphire. It is blue and purple in turns based on the light. babs23r, elle_71125, tigertales and 6 others like this. These are details difficult to identify in such pictures, so I am not sure what am I seeing or not. LightBright, princessandthepear, lovedogs and 2 others like this. It appears to be a matter of the lighting in the photos...as has already been pointed out just note the gold in the earrings and the stones in them also look distinctly different in the two images. Also it is really not only a question of "would it be possible" for a switch like this to be made but also a question of "why would they". Why would an established lab make a switch like this on a stone like this? There would only be two reasons why anyone would switch a gem. 2. To “replace” a lost or damaged gem. Replacing a gem with “like for like” doesn’t fulfil No 1 reason. A similar Kashmir sapphire, albeit a slightly different colour, would be worth a very similar amount of money. The switched gem would have to be a synthetic or another cheaper gem to make a worthwhile profit. The problem with reason no 2 is that there simply isn’t a vast inventory of Kashmir sapphires held by anyone, let alone a gem lab whose business is to review gems not sell them. Kashmir sapphires are rare, so again the chance of an identical Kashmir sapphire, except for a slightly different colour tone, being available to “switch” is virtually non existent. Without the original Kashmir sapphire being “mapped” for inclusion pattern or facet wear PRIOR to submitting for repolish or assessment there is unfortunately no way anyone can prove that the Kashmir sapphire you have IS the same one or prove that it ISNT. I only see two pictures, and I see a significant purple undertone in the first picture, which is the *before* shot. You can tell that the lighting is different in the two pictures because the first gold looks like yellow gold and the second looks like rose gold. The lighting would also have an effect on the stone. There is no reason to believe it's not the same stone. These are two of my sapphires. Exact same iPhone taking the photos but with different lighting conditions. You’d think they were different gems but they aren’t! Acinom, Starfacet, leukolenos and 5 others like this. Hey everyone, Thank you for your great replies. I don't have another picture this accurate of the 'original' to provide comparison. I've had the stone for 20 years, looked at it every day, and I knew it by heart. It was a perfect royal blue, with no color change at all, in any lighting, except to look more velvety and richer. The only additional pics I have would be of the stone returned to me. And yes, being conscious of lighting, position, time of day, even the season and sun's angle ( LOL) I took more pics, and still the color is so dark. I agree this is a such an odd possibility. I've never questioned a jeweler before, and never worried about switching, so that's not a common concern for me. Indeed, if I'd had any doubts I would have feverishly taken dozens of pics, mapped out the scratches and imperfections ad nauseum beforehand. But, I didn't. The color was the finest. That would be the motive. But, it's a wicked long shot, and remains a mystery. Here are pictures of the stone I have now, just for reference. You can see this does change color. Dark in ambient light, violet hue under incandescent. The original under relatively ( as humanly possible outside a lab!) same conditions as the above shot. So I thought I might chime in here. I am a professional photographer and retoucher -- so let it be said that I am NOT a jewelry professional - not a gemologist, appraiser, etc. but I am somewhat of an image expert so I hope that this might help. I color corrected (more scientifically than normal!) the images you posted between your original and new photos. As a sample, I used the widest part on the gold band and tried to match them as close as possible. And, in terms of HSB (hue, saturation, brightness) they are pretty darn close. Also, note, I only COLOR matched - so you should pay attention and can compare COLOR, and not brightness, etc. Here are the two images, with your first on the top and the "new" on the bottom. I also wanted to show you this. Photoshop has good color sampling, so I took to using the eyedropper tool (color sampler) in photoshop to pick a few areas out on your original image. You probably can't tell with the naked eye very well, but I can see a little hint and photoshopped confirmed my suspicion: When I color sample from your original stone, the samples I get actually ARE falling closer to the violet/purple spectrum of hue rather than the darker blue and cyan spectrum. This also supports my thought that MAYBE if anything your stone got polished, and you can now see more of that purple coming out in certain lights than you were able to before. There was already purple in your original stone. Honestly, I don't think the stone would be switched -- the above posters explained in better detail why that would be unusual and not productive. However, I hope some of this helps, and if you have any questions about the matching, the colors, etc. I would be glad to help as best I can. babs23r, voce, Lykame and 26 others like this. That is seriously cool. And WOW, the time you took to do it, and then scientifically explain it...amazing and thank you ! In any case a light polish would explain this. Lykame, Acinom, suzanne2 and 3 others like this. No worries. It would not surprise me if they accidentally polished it -- I would imagine it is such a common practice that they maybe just ran it and didn't even think/notice/receive your other instructions. A bit of a bummer, but all in all not the entire end of the world, and certainly not near your stone being switched! It's a beautiful stone! And, if you really decide you just can't live with it, feel free to send it to me. voce, elle_71125, snotty_pie and 6 others like this. I have to add something however...notice the green hue of the paper background...the color adjusting you had to do to get close to the color of stone #1 meant you had to add green, correct? Actually what's most valuable to me is the fantastic magnification of that corner, which I had been studying with a loupe to the point of headache for hours. Shows a pretty perfect match...unless they duped it with precision. But now I'm getting a little too Sherlock Holmes even for my own good. suzanne2 and rockysalamander like this. Your point is correct that anything could be color corrected to match the same, but the original photos were differently colored (this isn't to say that it's anything you did, but most likely rather your camera having a tough time and simply processing the images differently. Happens a lot. Also, I used the gold band as comparison for matching and then just looked at the stones as an "aftermath" effect -- NOT played with color until I thought the stones looked similar. tl;dr version: Color correcting is like an image wide balance scale and not specific "painting" sections. You have to choose what parts you want to neutralize unless you're editing for a particular purpose. As a PS -- As you've read from a trade member @arglthesheep gemologically speaking it's possible to do a "switch" but highly unlikely, I will reinforce this statement by saying that the level of precision required to make it stand up to a jeweler's loupe is borderline ridiculous, but the level of precision required to make it also stand up to image HSB and color comparison (which is the percentages that you see on the color map image) is borderline impossible - honestly something that I'm not sure even high, high level (think FBI type "coolness") could pull of with any degree of reliability. voce, partgypsy, kipari and 7 others like this. It does look different. Because it looks sleepier in the first photo. I think it's because they polished it or something and it's shiny now. It's a beautiful stone. iluvshinythings, Acinom, tigertales and 1 other person like this. Acinom, rockysalamander and amoline like this. The color correcting for those photos was done with RGB curves which is a little more complex than simply adding or subtracting a particular color. 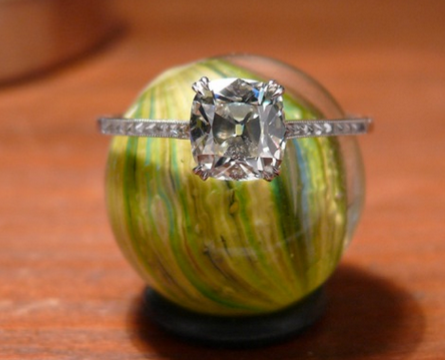 In any case glad we could help you and you'll have to post a photo of your stone in its final setting! Acinom, Starfacet and ChaiK like this.